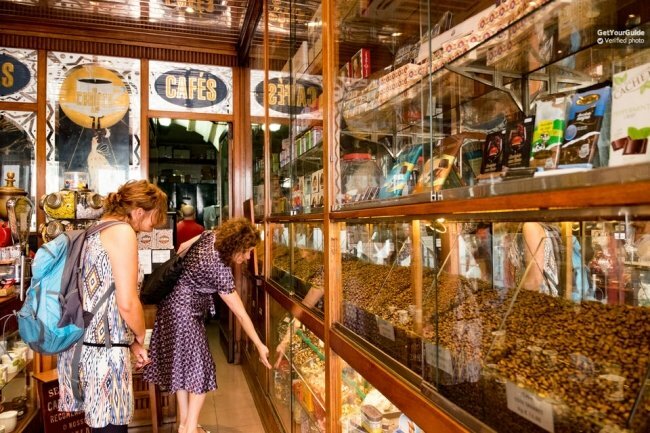 The Lisbon Essentials Tour departs daily at 10 am. Afternoon tours in English operate on Tuesdays at 3 pm from October to March, and 5 pm from April to September. Departure times for tours not in English can vary, please check ticket providers website. We are comparing Lisbon Essential Tour: History, Stories & Lifestyle Prices from leading ticket suppliers and Try to find you Cheap tickets prices on the market. The Lisbon Essentials Tour: History, Stories & Lifestyle is exactly what it says on the tin. During this 3-hour guided experience, you will travel through the centuries, investigating a variety of architectural styles that have been influenced by previous inhabitants of the city. You'll hear the stories of the Carnation Revolution and the fall of Portugal's dictatorship, and learn about the modern city's celebrations and festivals. Begin your tour by visiting the 16th century Bairro Alto, which became Lisbon's most popular district after the 1755 earthquake. Visit Sao Pedro de Alcantara Garden, the Jesuits Church and Museum of San Roque, the Carmo Convent Church, where the conspirators to the Carnation Revolution found their feet in 1974. Enjoy views over the Targus River, explore Lisbon's oldest district, the Alfama District, and see significant city landmarks including the National Pantheon, Lisbon Cathedral, and Monastery of Sao Vincent de Fora. Your friendly local guide will lead you through the famous Fado houses and take you over above the city to Portas do Sol on one of Lisbon's City trams. Hear about the Festival of the Saints and other of Lisbon's traditions and historic features. This tour is a great way for visitors to see a lot of Lisbon and learn about the history of the city, from it's foundation to the modern city we see today. Suitable for both adults and children, couples or individuals. The Lisbon Essential Tour is for people who prefer a personal tour, with time to ask their guide questions on a small group tour. Your Experience With Lisbon Essential Tour: History, Stories & Lifestyle? See the top sights of Lisbon on a guided walking tour of the city centre. Have the flexibility to choose the time and preferred language of your tour. Visit two of Lisbon's most interesting districts; Bairro Alto and the Alfama district. Hear stories of Lisbon and learn about local culture from your professional tour guide. Travel like a local on one of Lisbon's Trams. Take your holiday snaps from Sao Pedro de Alcantara viewpoint. What Lisbon Essential Tour: History, Stories & Lifestyle Includes? 3 Hour guided city tour. 1 snack and beverage (coffee & cake). If you plan to take the English tour in the afternoon/evening make sure that you are in Lisbon on a Tuesday, this is a more comfortable time of day for walking during the hot summer months. Travelers Reviews about Lisbon Essential Tour: History, Stories & Lifestyle? This is a relatively new tour to be listed on trip advisor and as such does not have many reviews to compare. However, recent reviews from a range of nationalities have given The Lisbon Essentials tour a 5 out of 5-star rating. Reviews agree that the tour guides provide an informative and personal walking tour and the it's a great way to see the main sights of the city. This tour may not be practical for wheelchair users. Your ticket will be sent to you by email. Please show your guide your ticket in electronic or printed form. Viator will give full refunds for cancellations made at least 7 days in advance, cancellations made less than 7 days in advance will incur a partial or full cancellation fee. Minimum of 2 participants is required. The Lisbon Essentials Tour is available in English, Portuguese, Spanish, Italian, French, German, Russian, and Polish. Confirmation of booking will be provided within 48 hours of making the reservation. Unless specified no extra food or beverages are included in the price of the tour. Exact location will be provided in the booking confirmation.